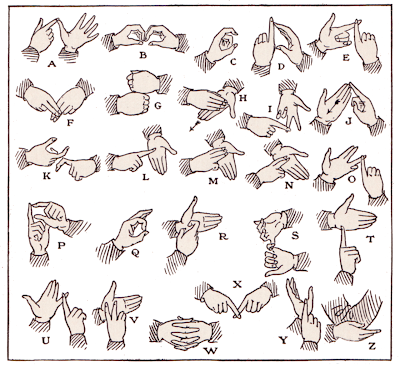 This was just what you were looking for to give your thieves guild or local frog-god cult some secret hand signs, isn't it? Or maybe that ominous statue in level four of your megadungeon requires a certain sequence of signs to get past safely. Use the letters as a key. Only, let us know of any devious devisings you come up with for these. Found here from the Book of Knowledge Vol. 17.